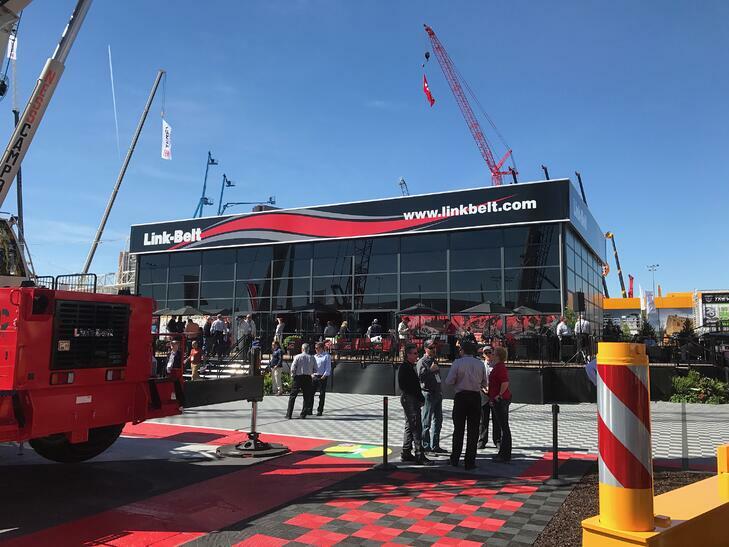 A well-known construction equipment company, a market leader in the design and manufacture of mobile cranes, exhibits at two major trades shows — each of which occurs every three years. 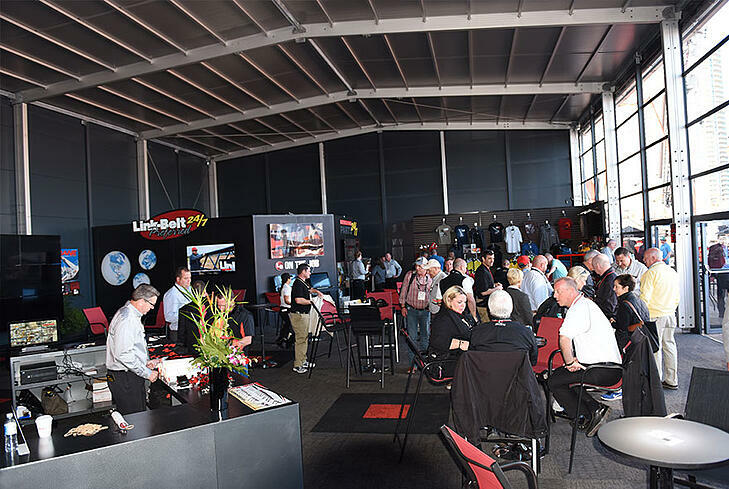 In 2017, the company turned to Mahaffey to provide a high-profile, eye-catching exhibition space for the CONEXPO-CON/AGG trade show in Las Vegas. CONEXPO-CON/AGG is a unique event that brings together more sectors of the construction industry than any other trade event. Professionals who attend have access to sessions covering asphalt, aggregates, concrete, earthmoving, lifting, mining, utilities and more. The event takes place once every three years, and every major construction industry is represented amongst 2,500+ exhibitors over 2,500,000 square feet and more than 150 educational sessions. With so many exhibitors and opportunities, finding a way to stand out from the crowd is essential. 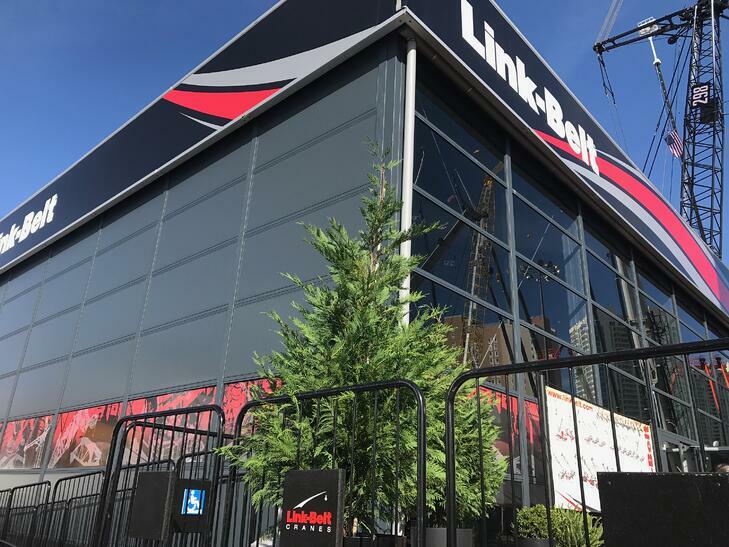 One of this client's biggest challenges in constructing a prominent exhibition space for these trade shows is the sheer size of its cranes, which require a large outdoor exhibit. To keep customers engaged beyond the initial demonstrations, the company wanted a structure that could house demonstrations, a two-story reception and multiple conference rooms. 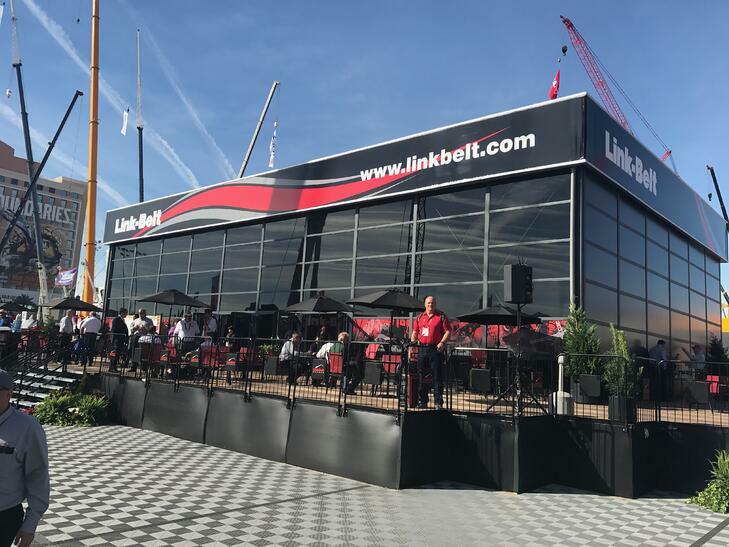 Mahaffey has provided stand-out structures for the CONEXPO-CON/AGG event in the past, but we wanted to deliver a new, exclusive option to showcase the client's brand, unlike anything else at the expo. To create such a unique space, we installed the Manhattan Matrix by Mahaffey. This state-of-the art special event structure is unlike any before it. The unique 50-foot by 100-foot fully-enclosed structure is modular and completely customizable, with telescoping legs and modular, interchangeable parts that allowed us to modify the height and design to fit each requirement. The resulting structure looked nothing like a tent, rather the all-glass front eave side created the appearance of a modern, permanent building. The sound-proof walls and amenities — such as HVAC, lighting, flooring and more — allowed guests and employees alike to interact in the quiet, comfortable interior. The Manhattan Matrix provided our client with an aesthetically-appealing event space that drew a great crowd throughout the three-day expo. Its distinctive, sizable black vinyl panel allowed the company to prominently and beautifully display its brand, and the all-glass front eave with a deck created the look and feel of a luxury oasis. Thanks to Mahaffey, the client had an ultramodern event space to host and entertain its clients at this renowned show. CONEXPO is our biggest show in regards to attendance. Hundreds of people visit our exhibit daily. At times, the building is packed with people experiencing what we have to show. We have an elevated Biljax deck with the Manhattan elevated at the same height. We call it our 'front porch.' Our distributors and their customers will spend hours every day of the show at our exhibit. We work hard to create an inviting space, and the Mahaffey group and the Manhattan structure go a long way to make that happen. Interested in learning more about Mahaffey's solutions for high-end events, or want to speak with an event specialist today?